2014 GP3 champion and involved with no less than three Formula 1 junior programmes over the years, Alex Lynn is a driver with an impressively diverse career. 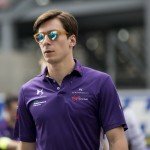 To which he now adds Formula E, stepping up to his Reserve Driver role with DS Virgin to pair with Sam Bird in New York. Following two seasons in GP2, Alex has moved on to combine three endurance racing roles – he won 12 hours of Sebring with Daytona champions Wayne Taylor racing, competes in WEC LMP2 class with G-Drive and contested the 24h of Nurburgring with Rowe BMW. Not totally lacking experience in a Formula E car, he tested the Jaguar at Donington last year, as favourite to get the role before losing out on the seat to Mitch Evans. Alex maintained his interest in FE though and was confirmed as the DS Virgin reserve earlier this year, as WEC clashes made it clear he would gain race time. Current teammate Sam Bird was his young driver mentor back in his early days in cars, during two seasons in Formula Renault. He went on for a further two seasons in the New Zealand-based Toyota Racing Series before moving on to a third-place finish in European F3 and victory in the Macau Grand Prix, which sent him onwards into the Red Bull Junior programme for his rookie GP3 Championship victory. He raced for Renault-linked DAMS for two seasons in GP2, before moving on to sports cars and FE and was the Williams Martini F1 test and development driver from 2015 until the start of this season.